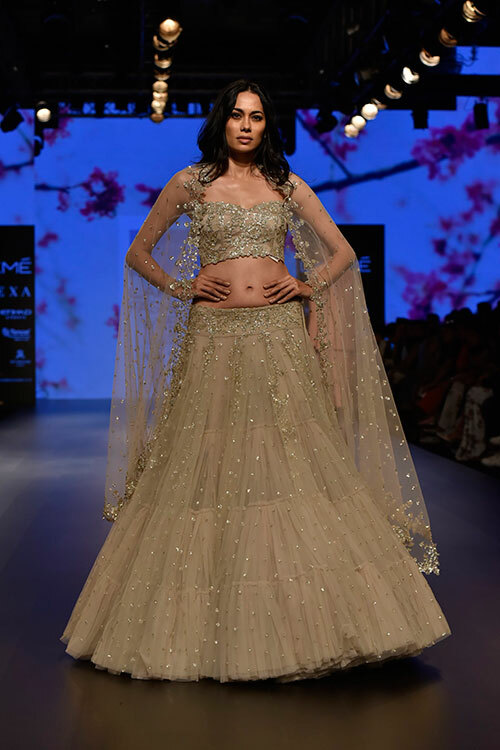 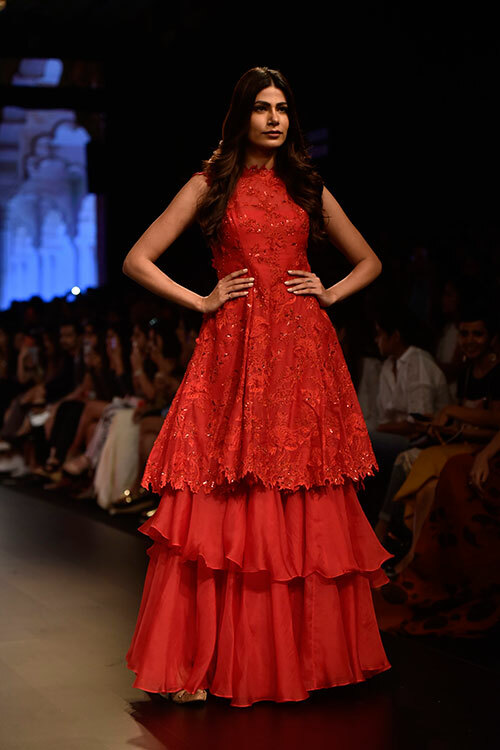 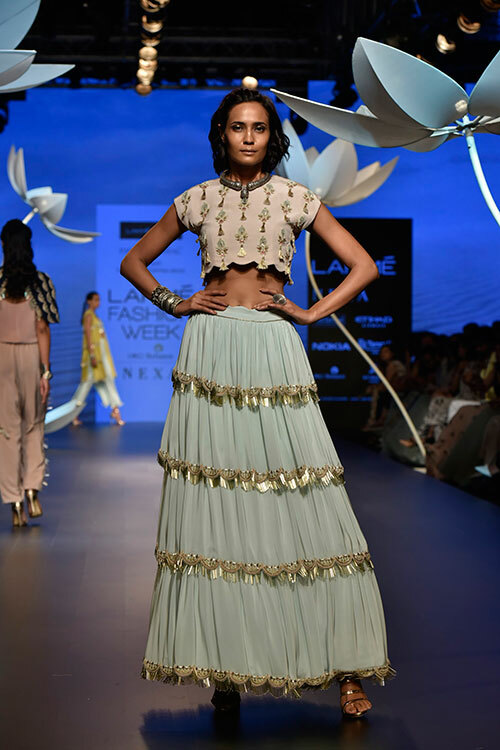 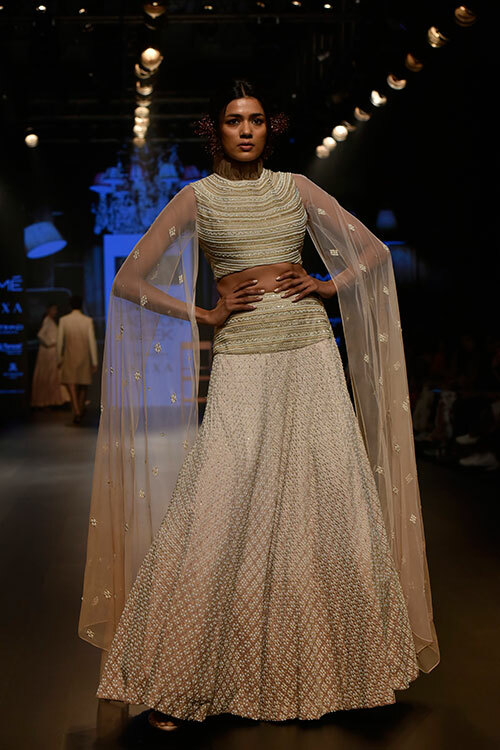 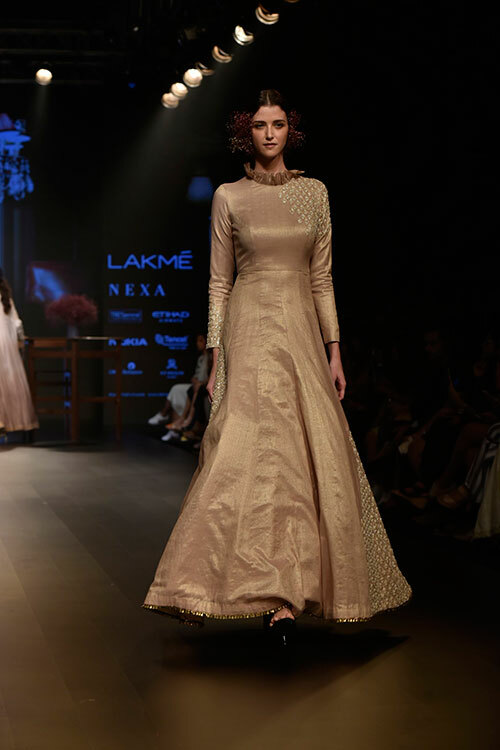 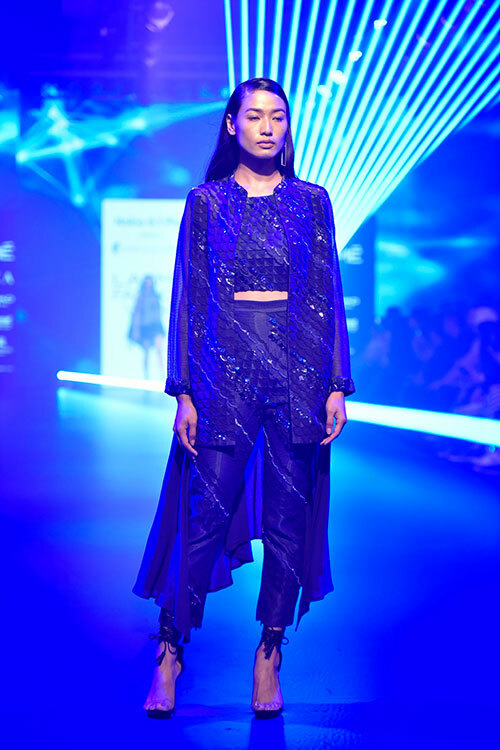 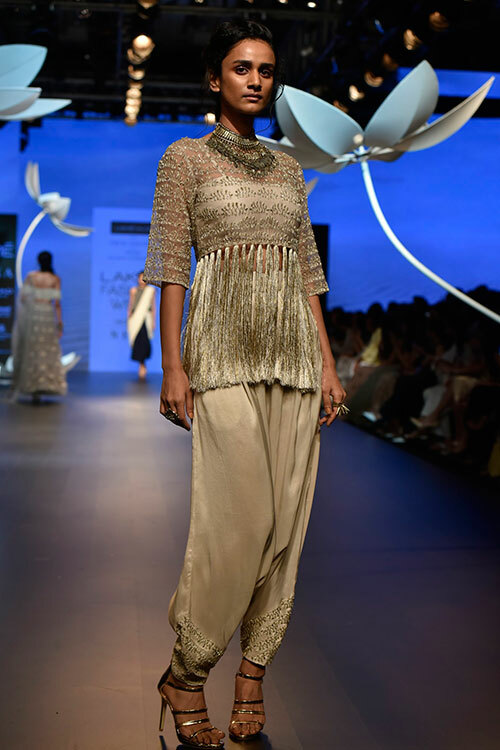 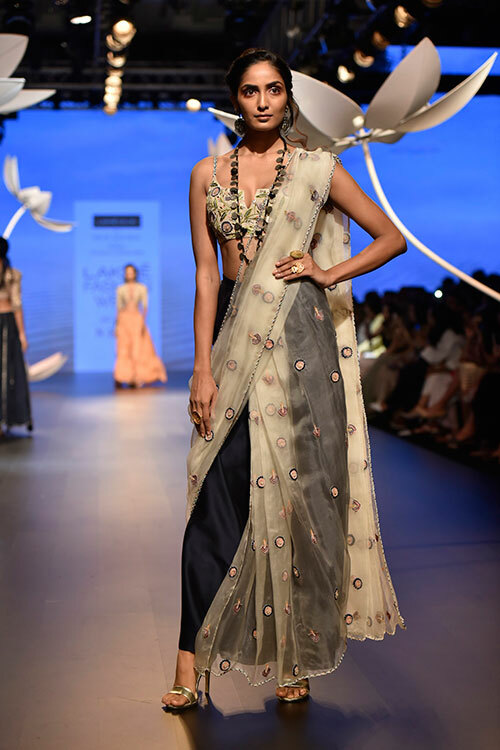 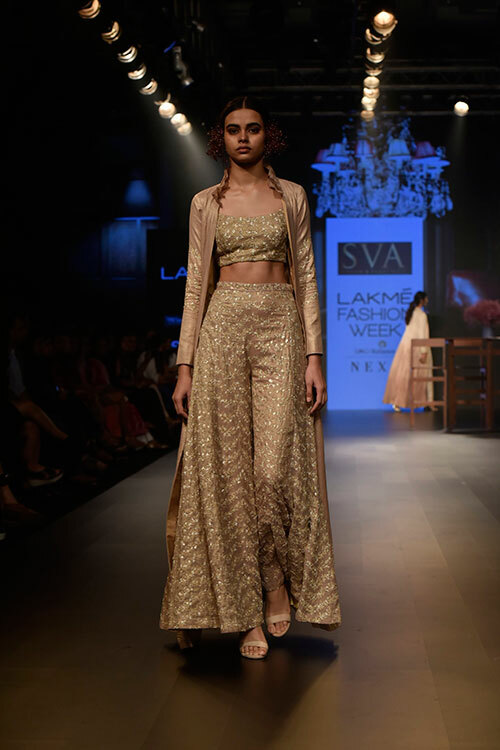 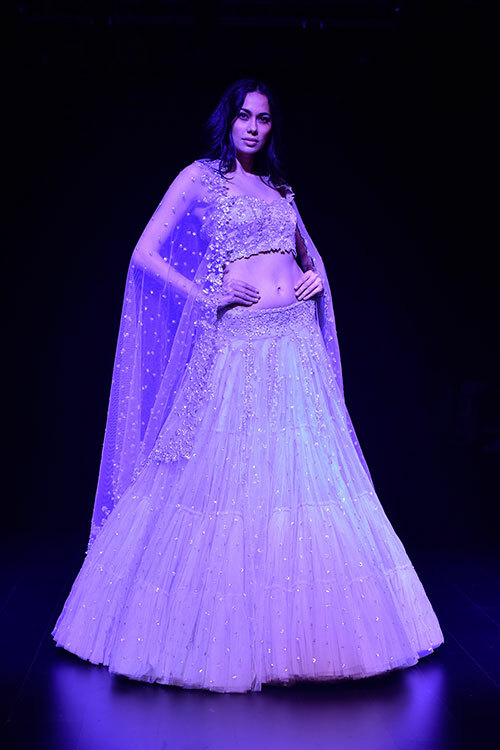 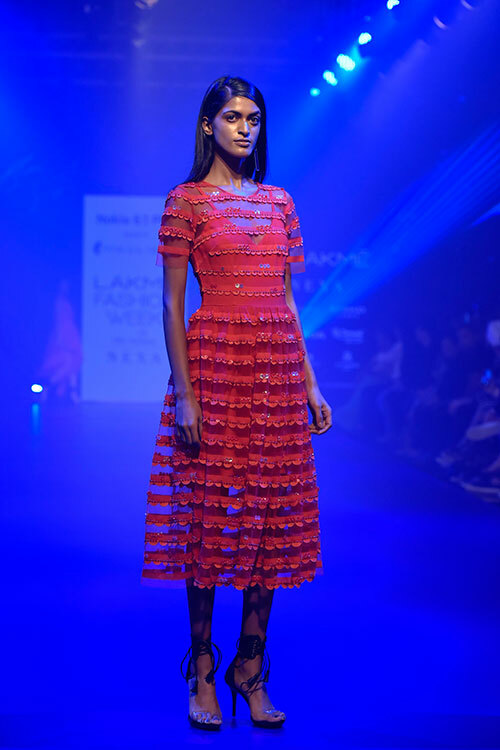 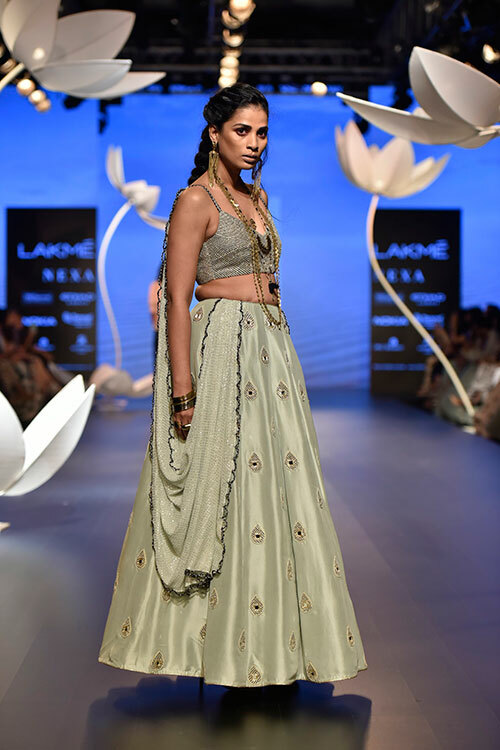 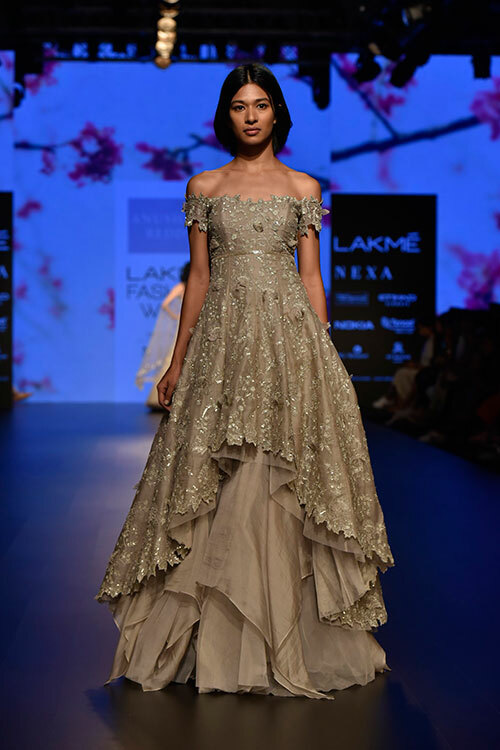 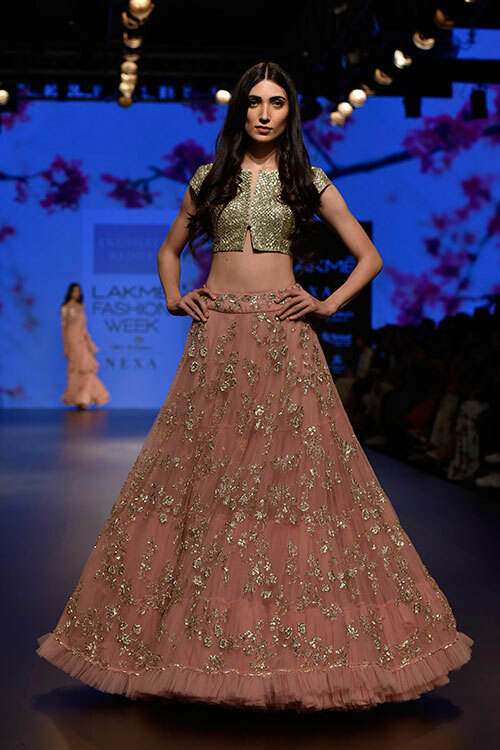 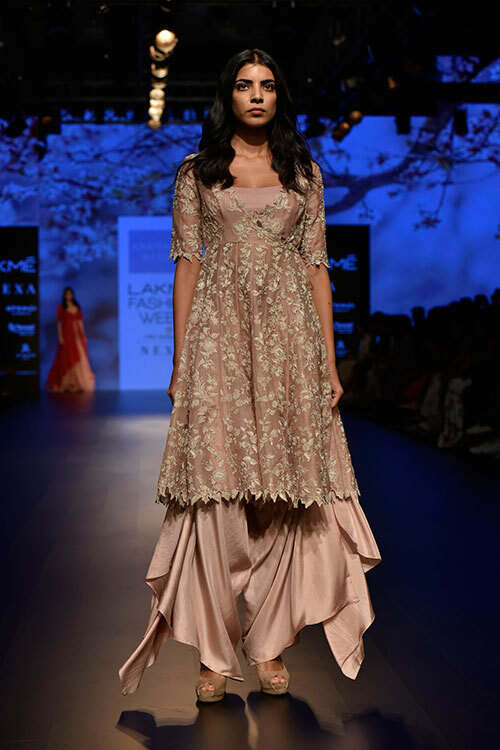 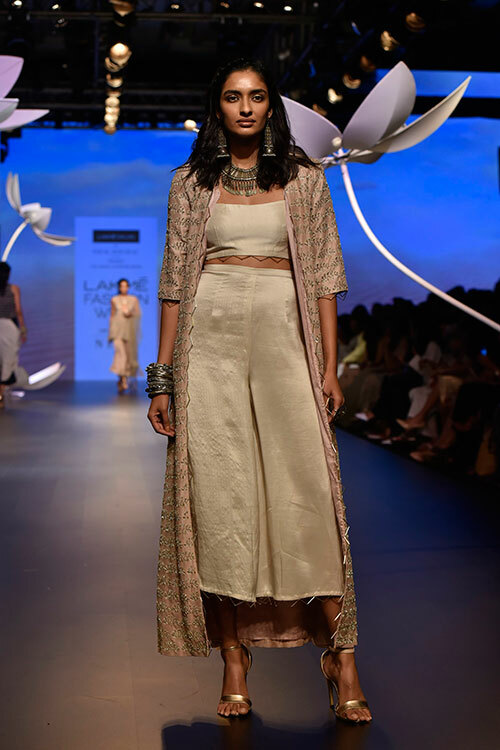 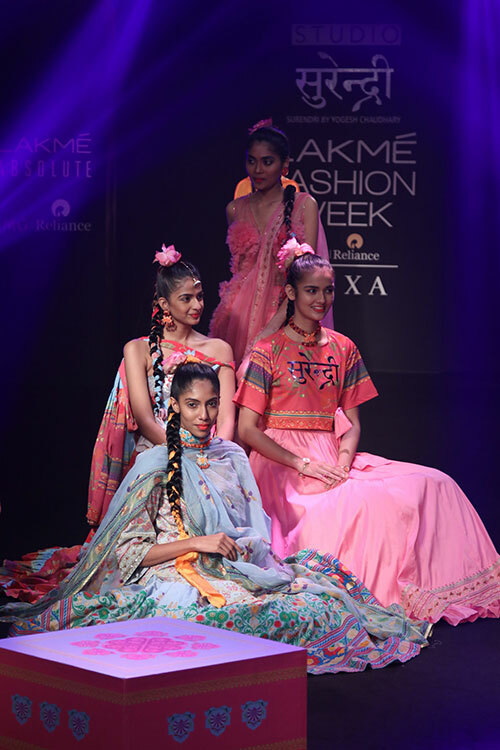 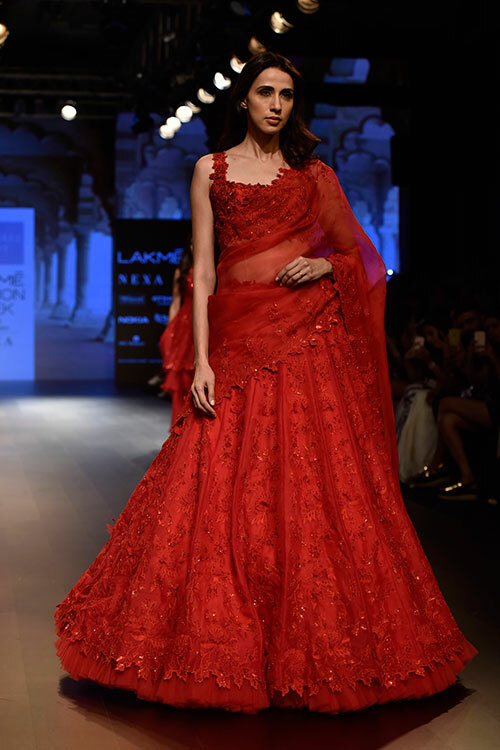 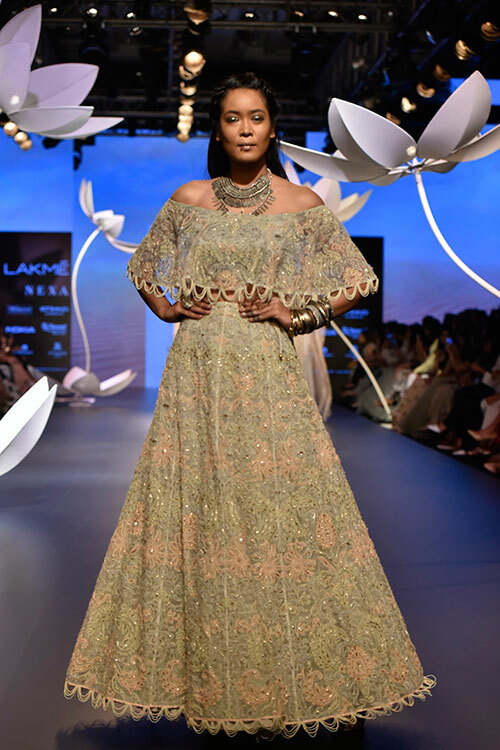 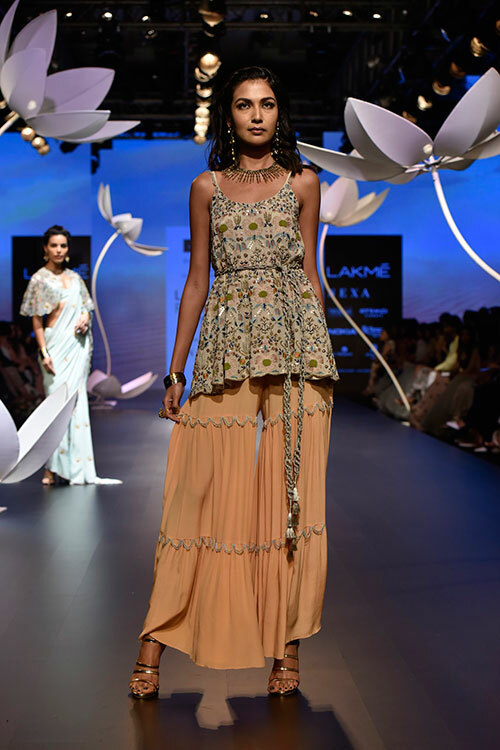 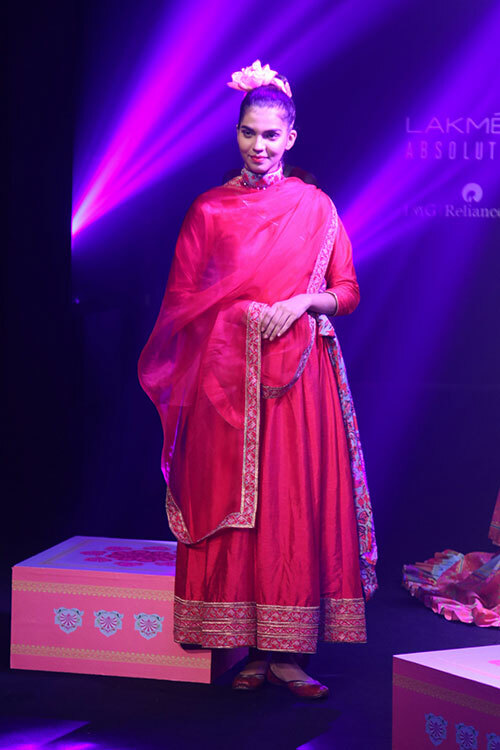 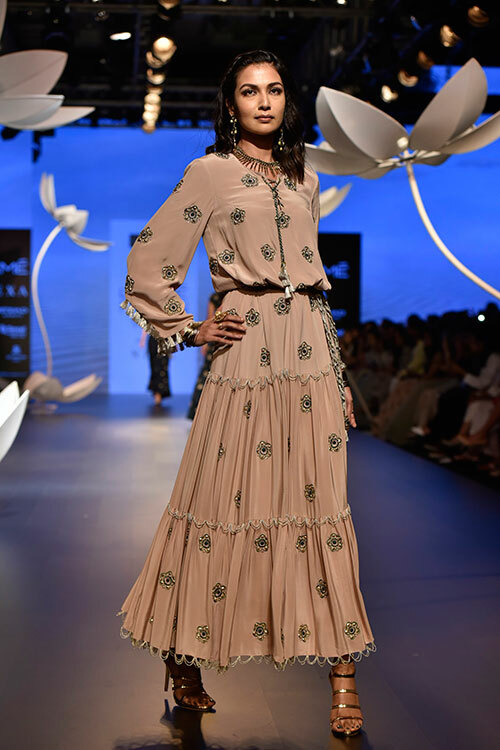 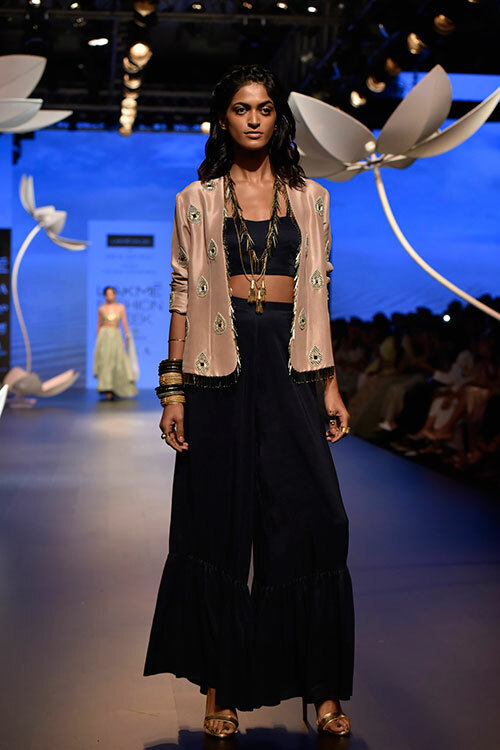 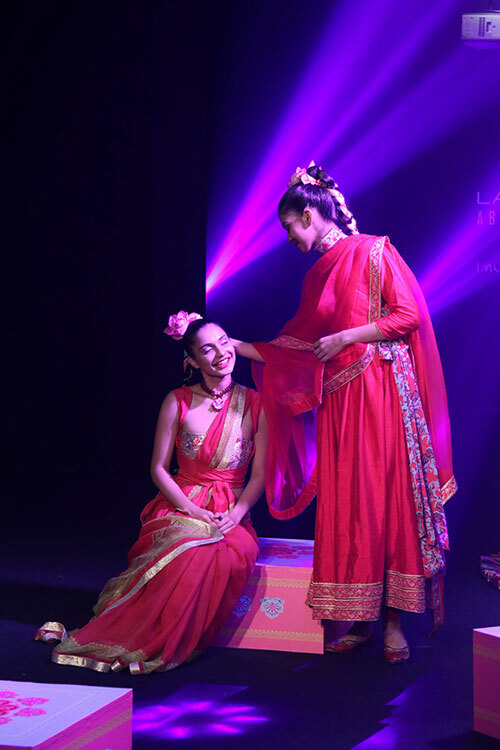 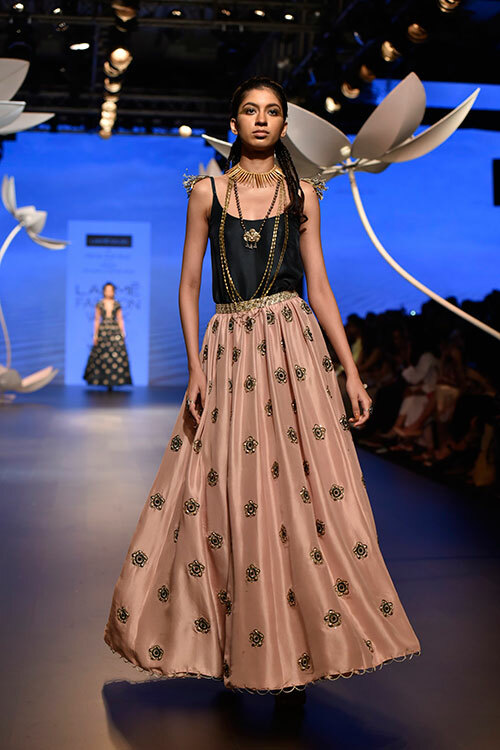 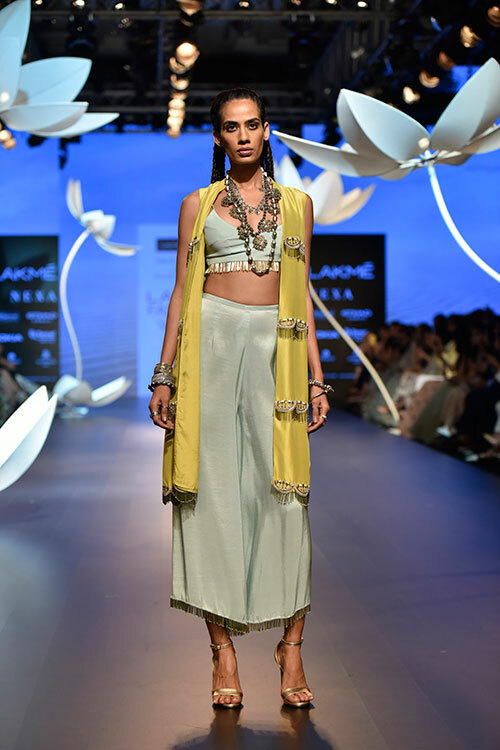 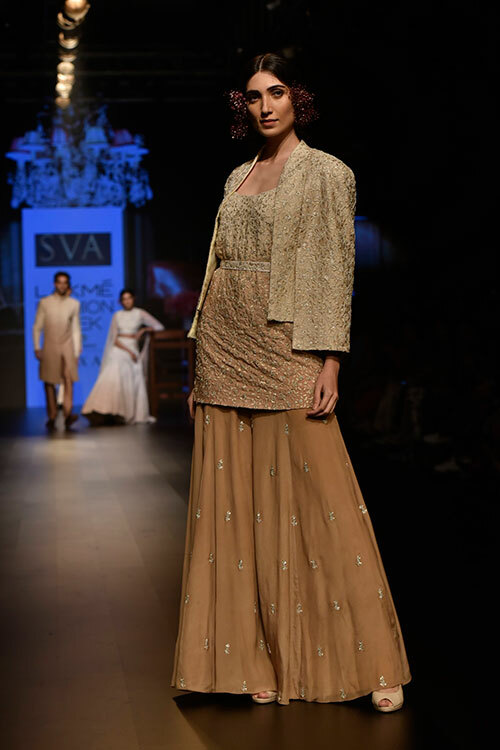 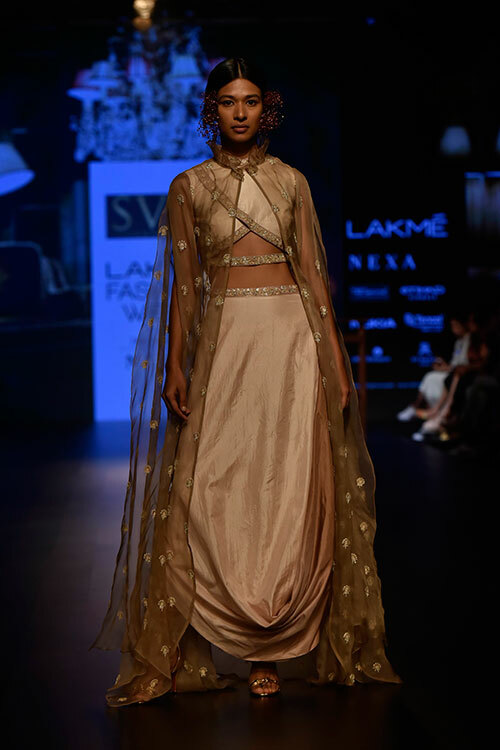 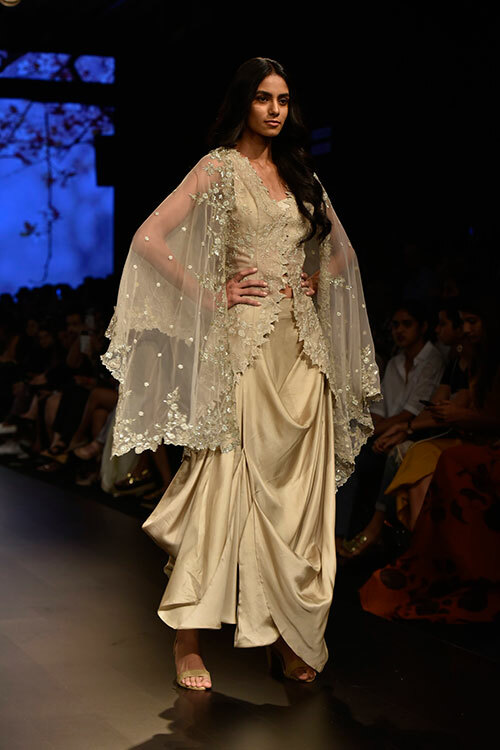 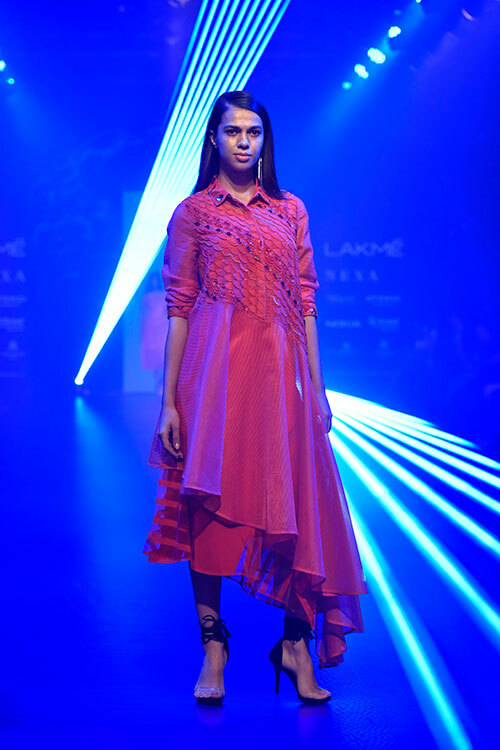 Reaching for the stars, Anushree Reddy brought them down for her collection ‘Sitara’, inspired by Nizami clothing. 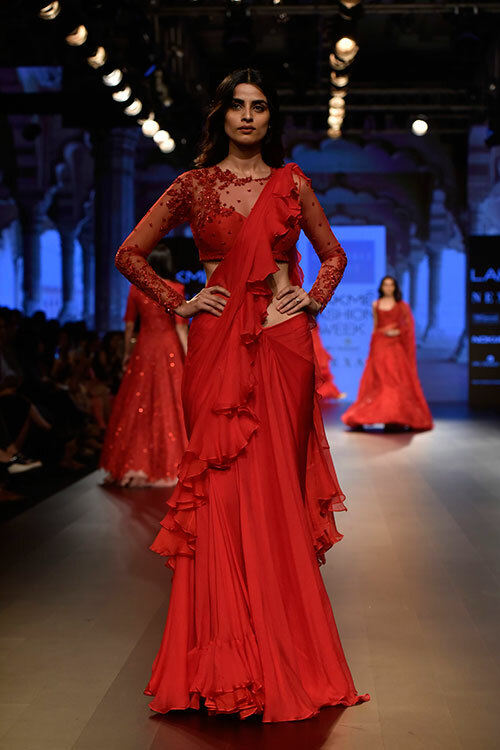 Her occasion-wear line sparkled with elaborate techniques, sensual colours and decadent drapes. 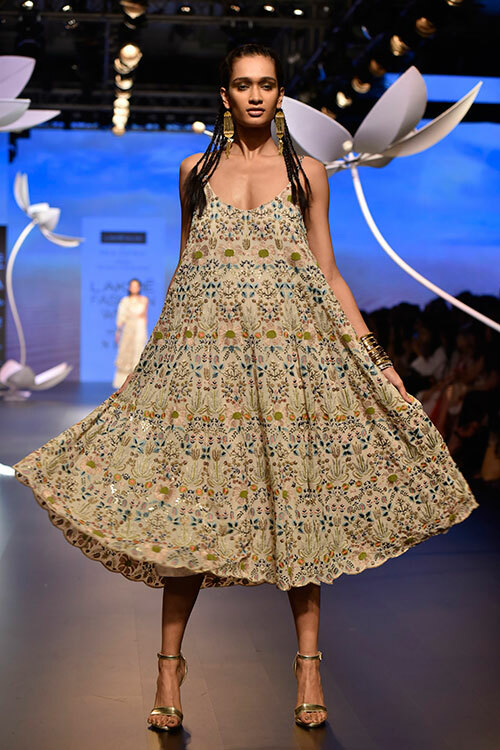 On staples such as salwars, saris and lehengas-cholis, she worked with 3D fleur, butterflies, leaves and fictional characters as appliqués to create eccentric designs. 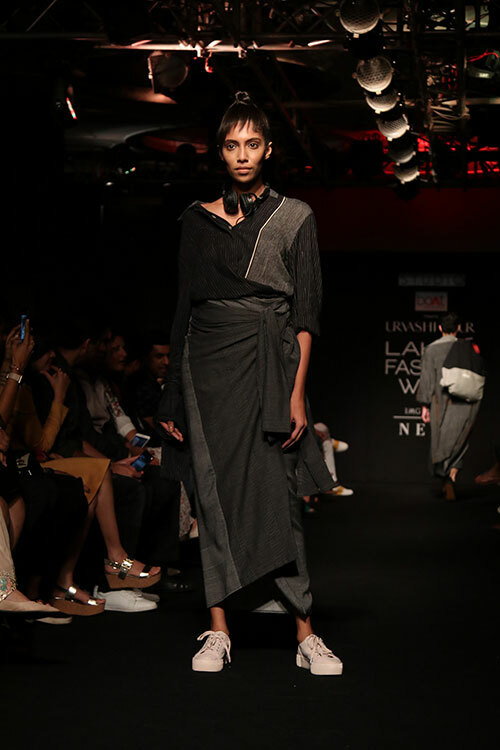 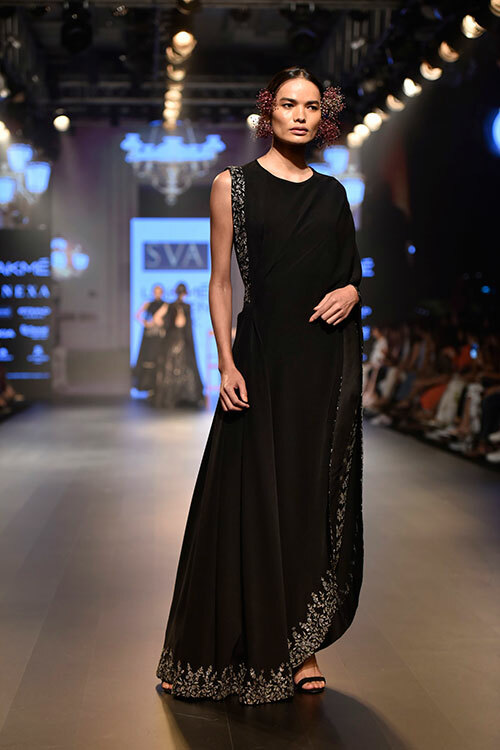 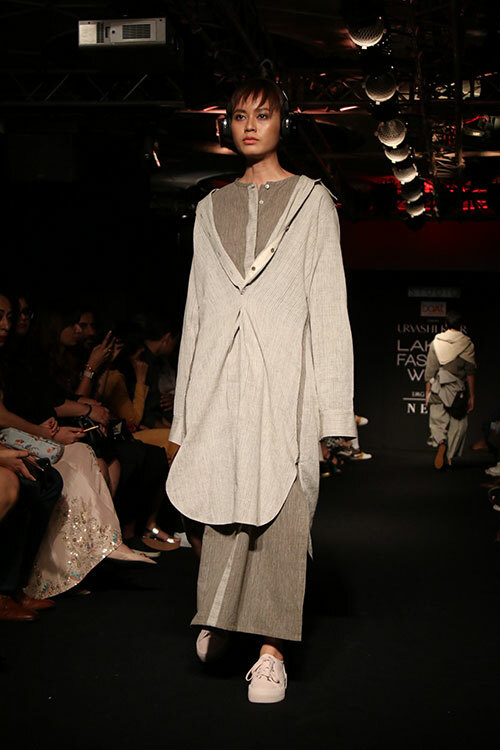 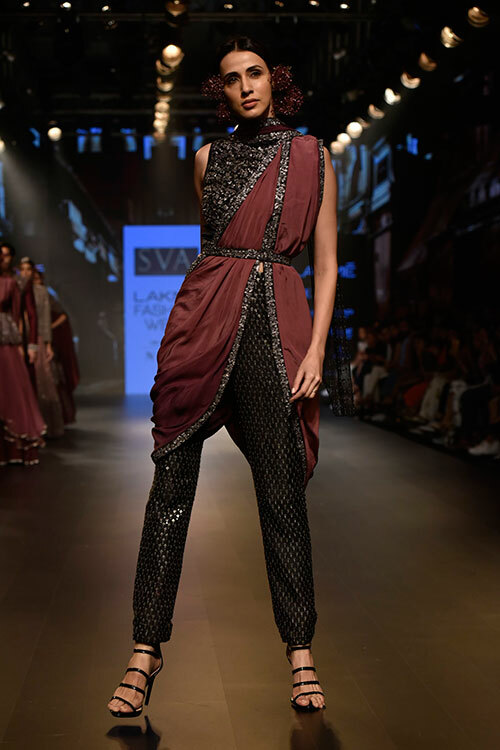 Sonam and Paras Modi’s collection for SVA was deep, and mysterious. 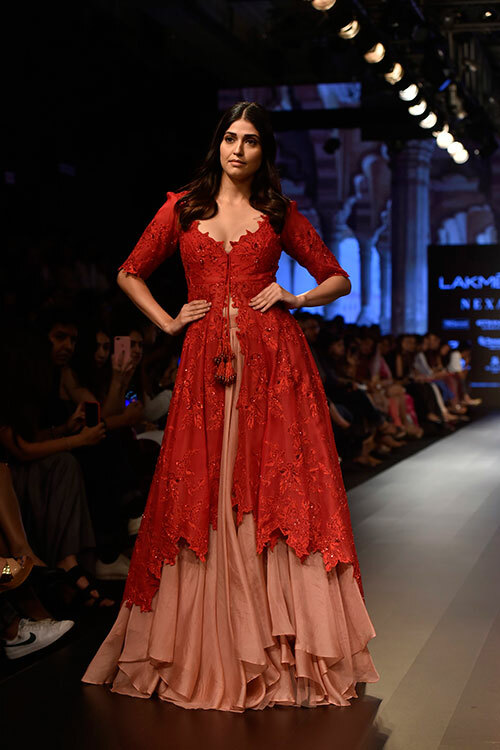 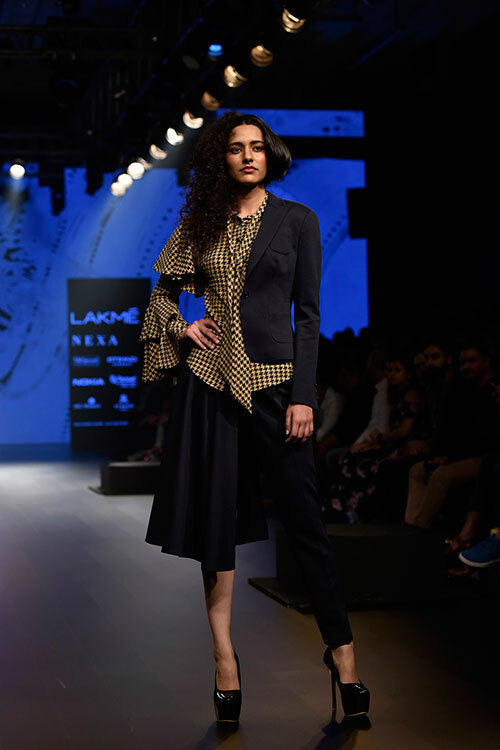 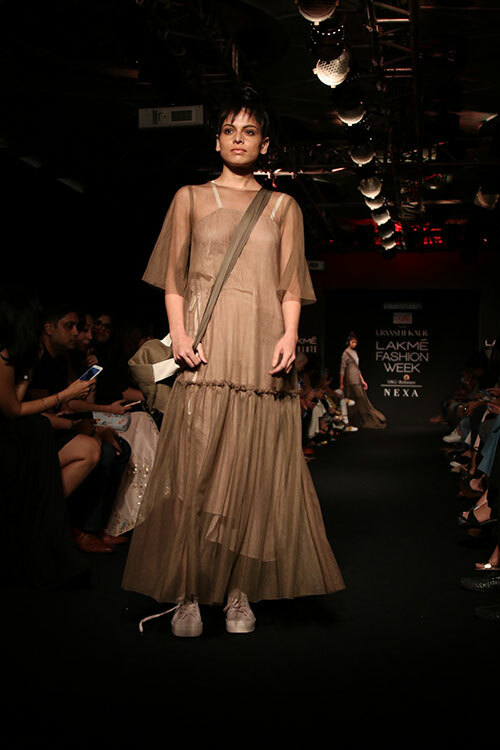 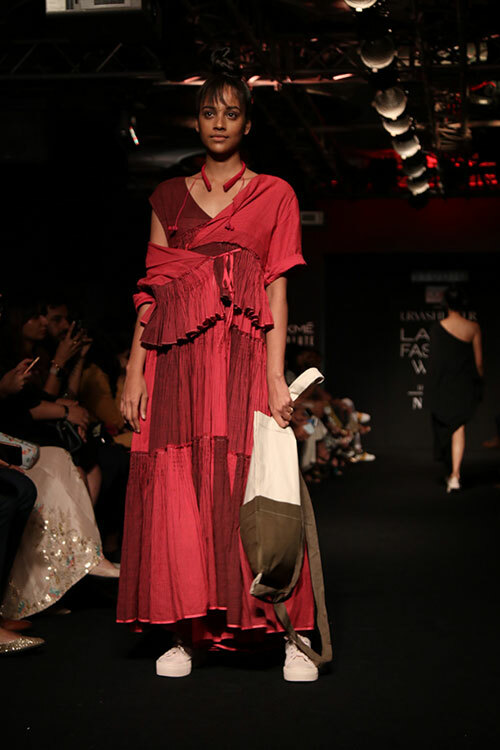 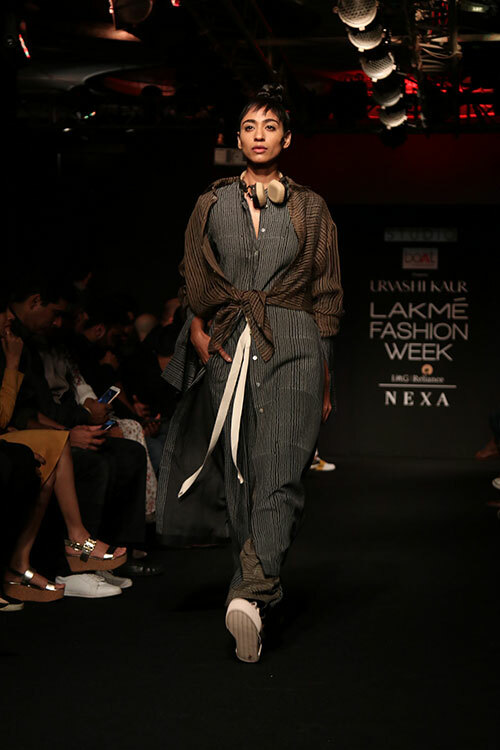 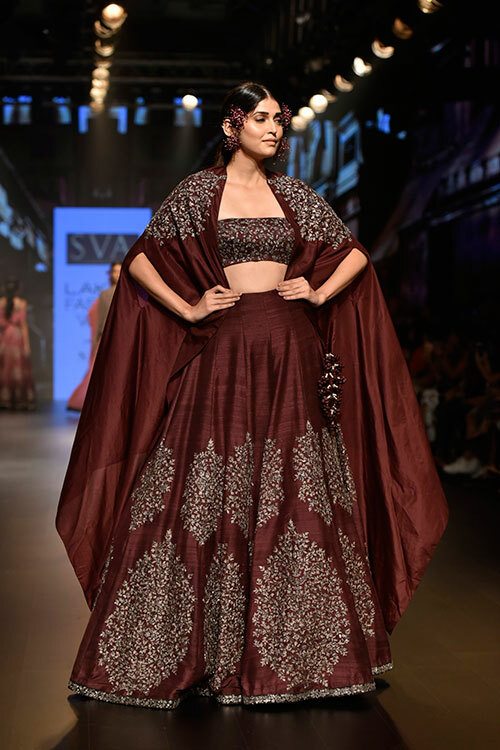 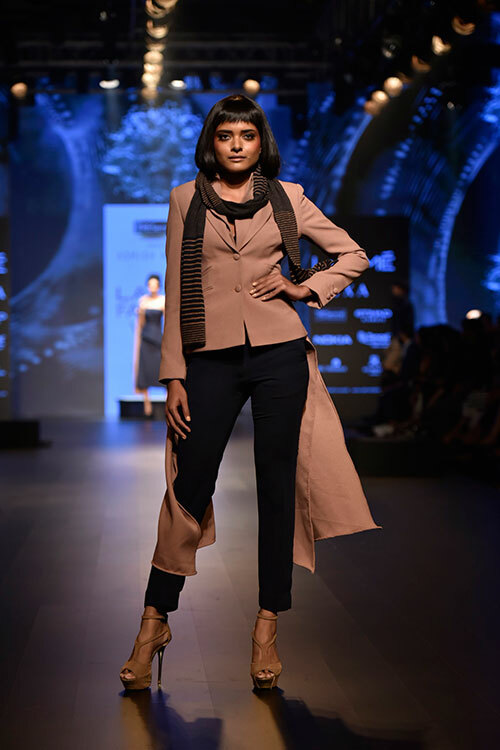 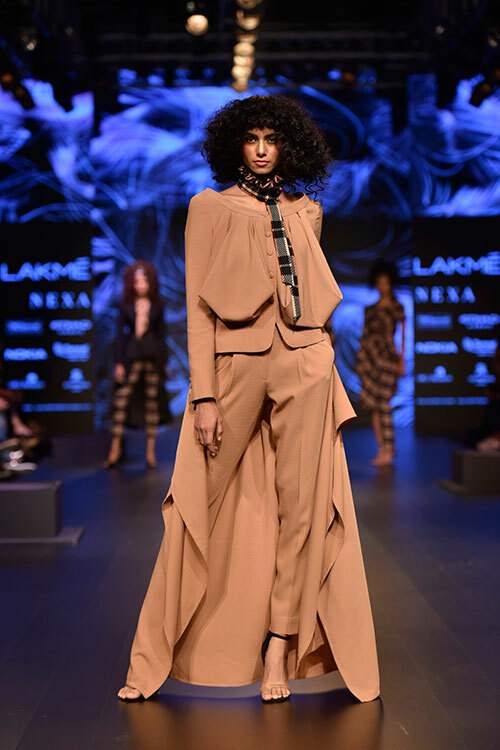 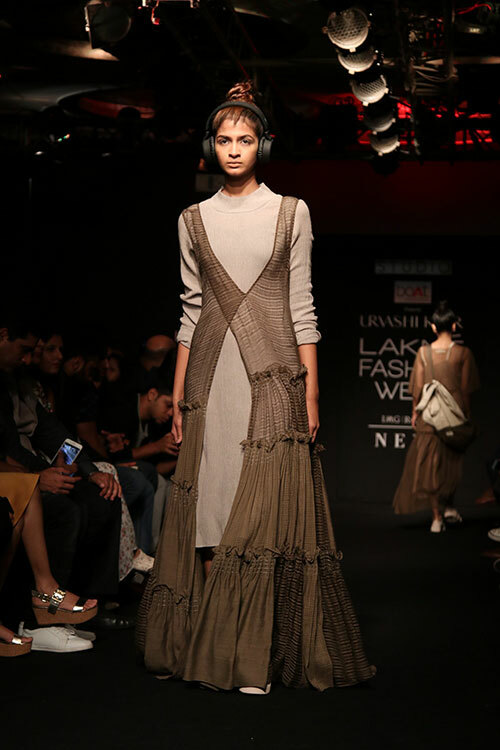 Titled ‘Merlot’, it showcased occasion-wear in the colours such as maroon and burgundy, pairing them with beige and black. 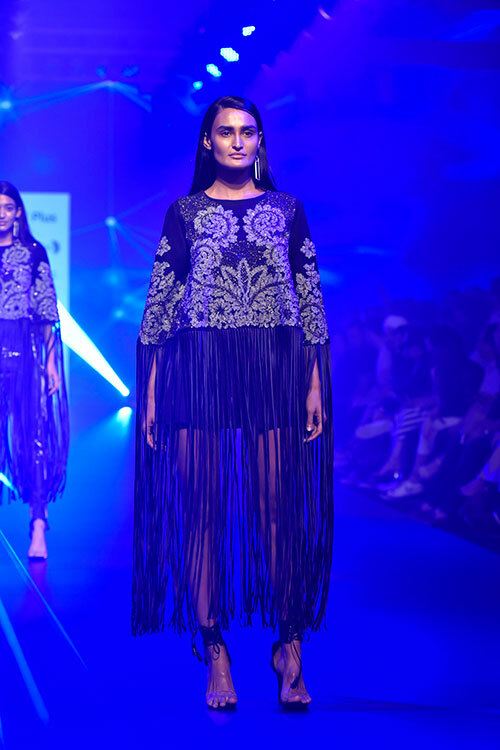 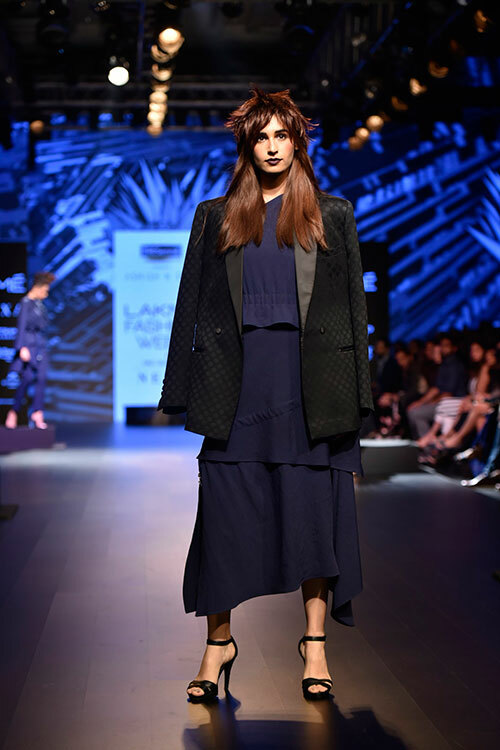 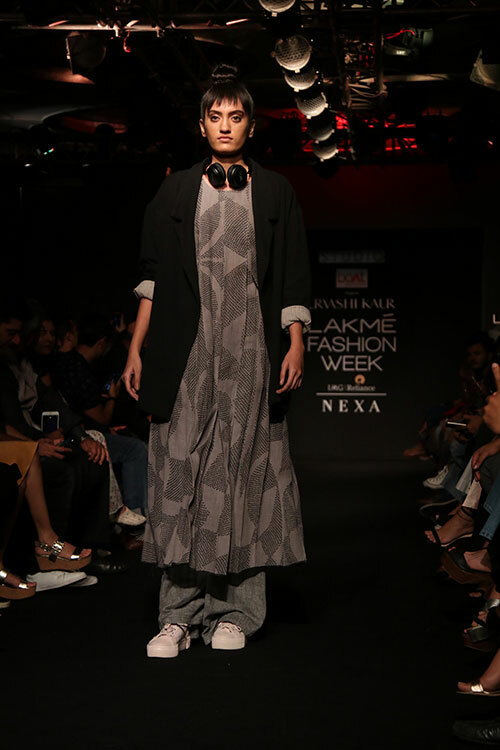 From contemporary cuts, embellished jackets and peplum blouses to loose embroidered kurtas, the duo presented a versatile range of silhouettes. 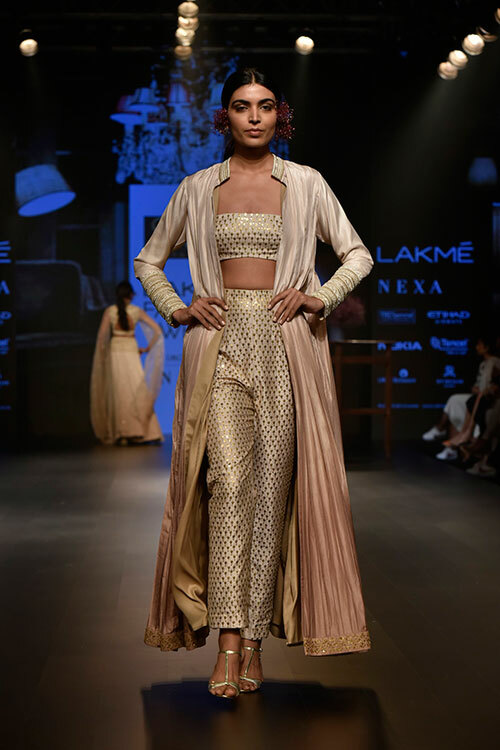 What really stood out was the use of shimmering mixed metals with delicate ombré fabrics — draped and pleated — creating an enchanting balance. 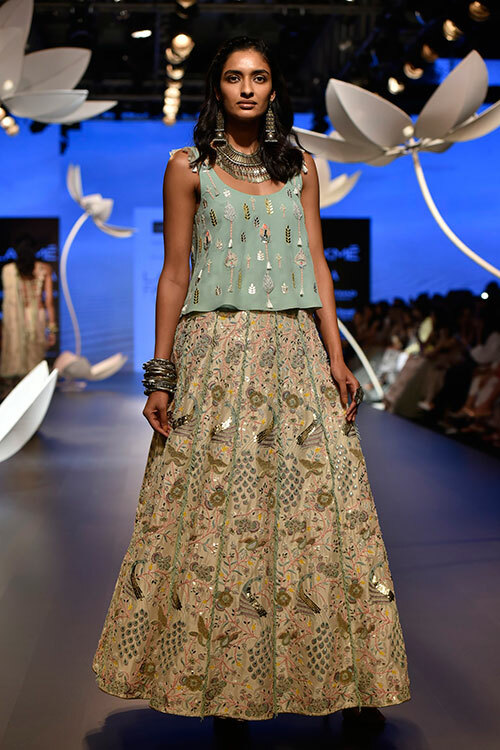 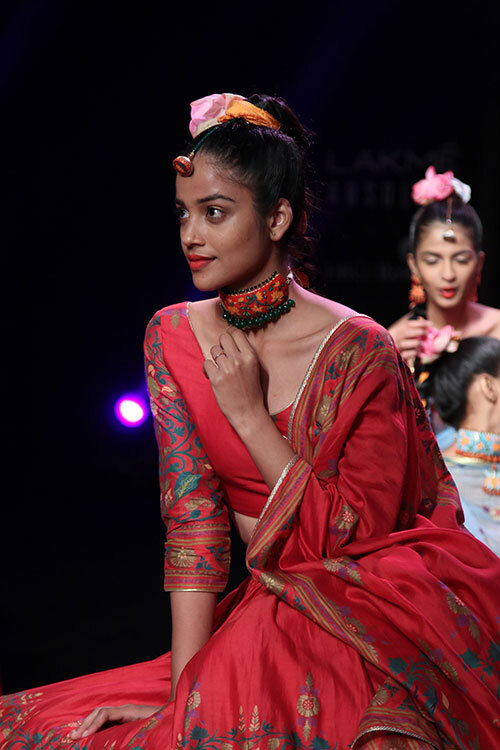 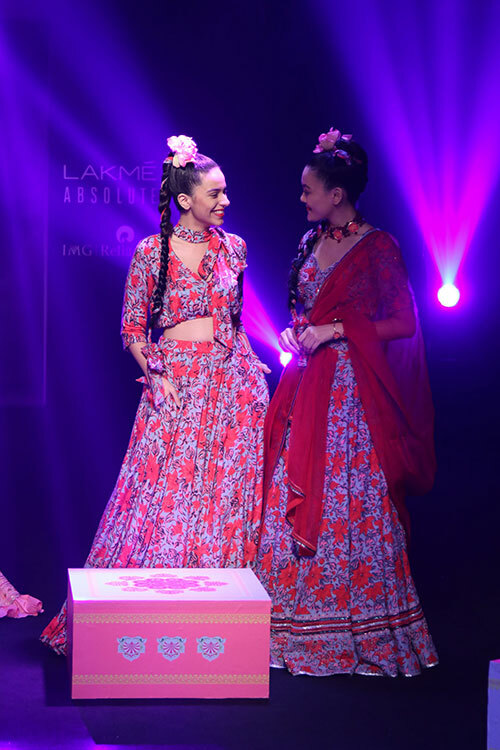 The designer brought the rustic Rajasthani tradition of ‘Rangoli’ to life, with his collection of the same name. 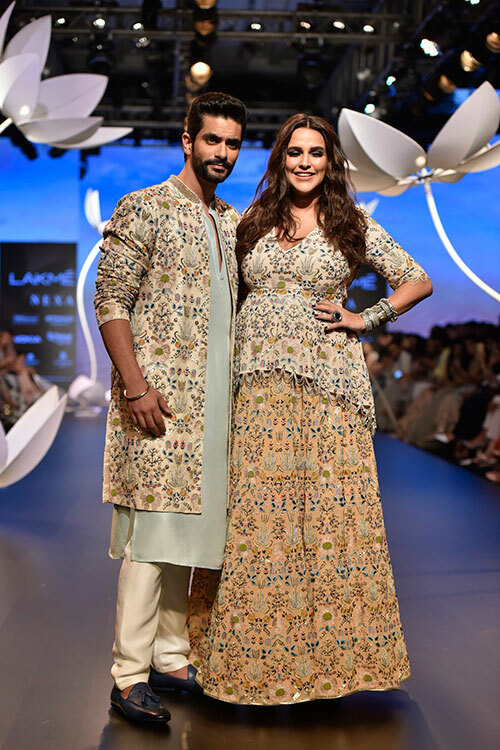 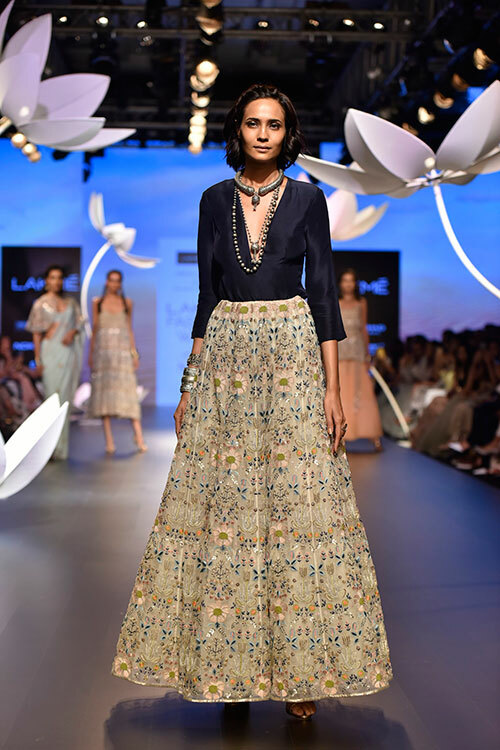 The festive-wear line comprised beautiful offerings with gorgeous Sanganeri prints, abstract floral motifs and rainbow hues that glittered with gold and silver embellishments. 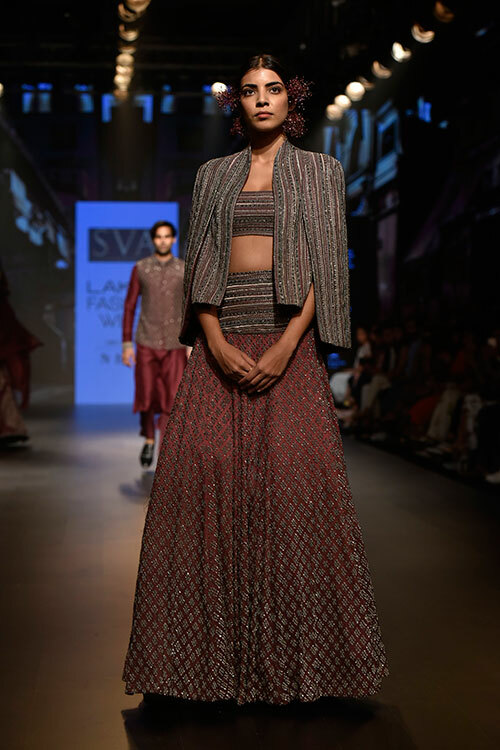 For her ‘The Show Stopping Bride’ line-up, Payal Singhal looked at folk art tapestry to create the collection titled, ‘Mu’asir’. 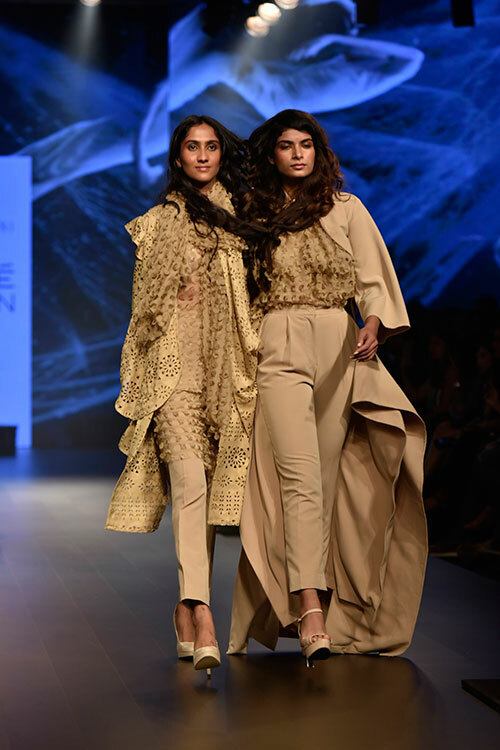 The concept of one of the oldest hand-crafting techniques in the world, grew through the renaissance period across European countries, with the influence of Persian artistry. 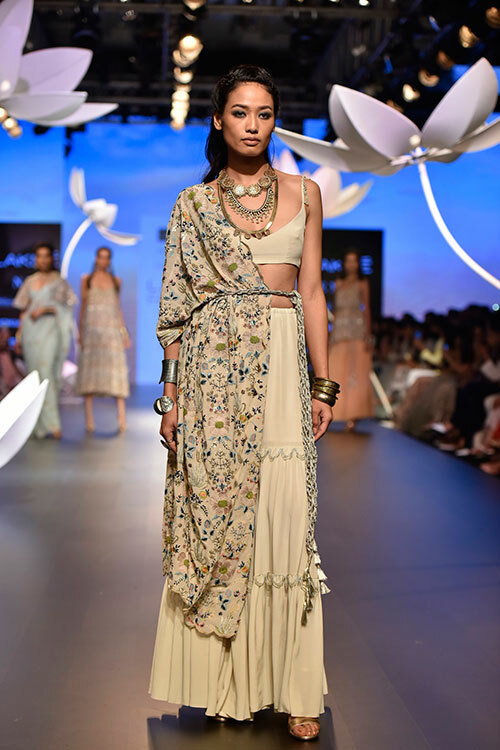 The amalgamation of this was festive-wear with striking characteristics of threadwork with zardozi, appliqué and beadwork with frayed embroidery and accents of various kinds of tassels and edging in an extensive colour palette of neutral tones like grey, ivory along with pastels like rose blush, mint, sage, cantaloupe, powder blue; bright shades of yellows, corals and pinks; deeper shades like emerald green, navy blue and deep purple. 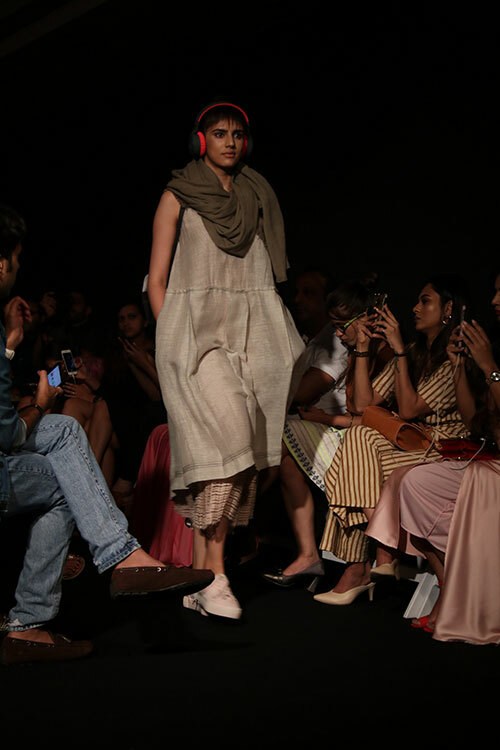 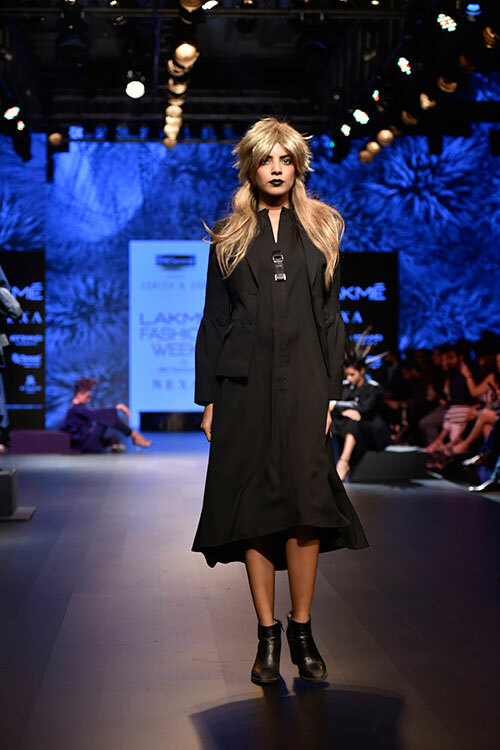 Taking technological inspiration from the newly released Nokia 6.1 Plus, the designer duo showcased a ready-to-wear collection that brought together the best of handcrafted and machine-made ensembles. 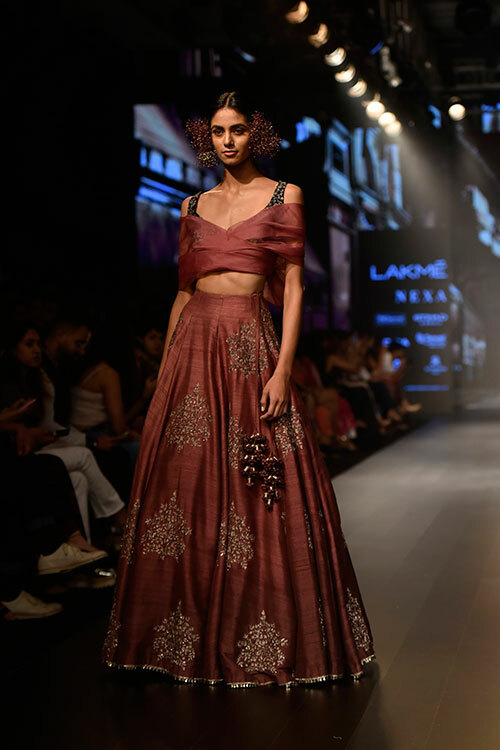 A flurry of dresses, trousers, tops and gowns came down the runway, with their defining qualities being specially engineered materials such as patent finish faux leathers, metallic hyper-twist yarns and graded geometric gemstones. 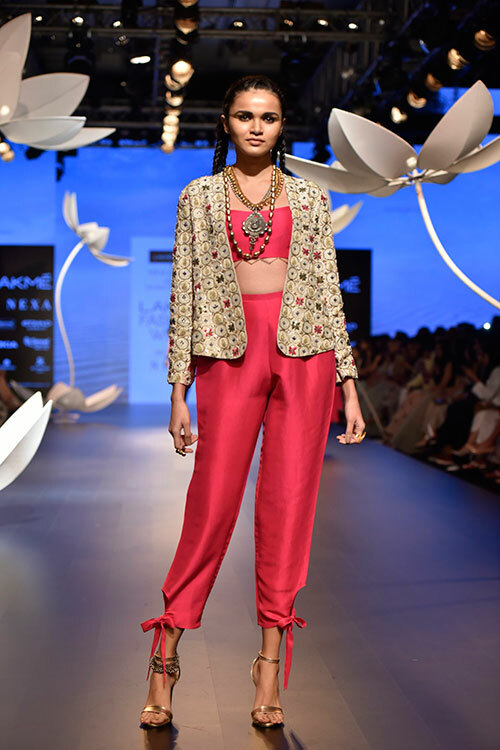 Every detail was hand applied using technically precise floral and ornamental artworks. 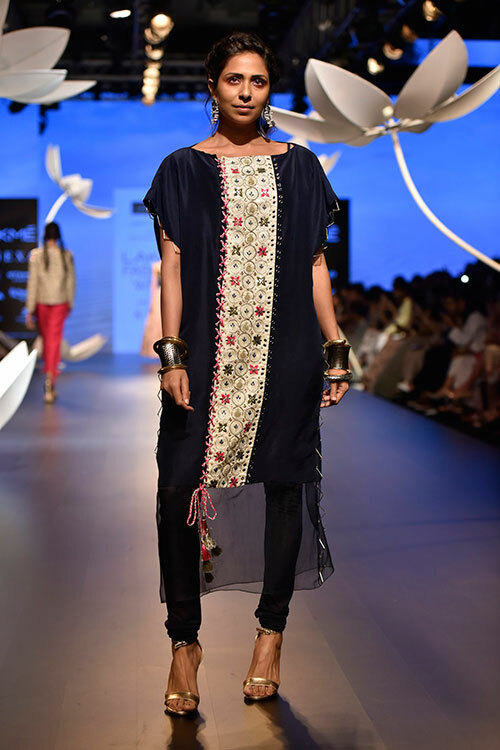 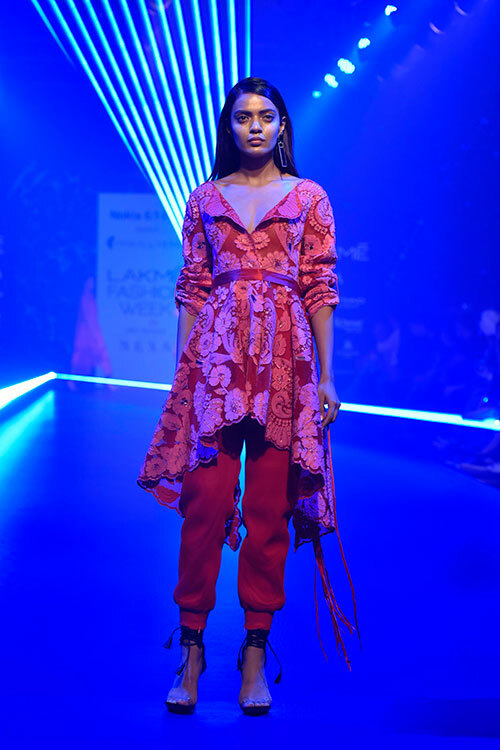 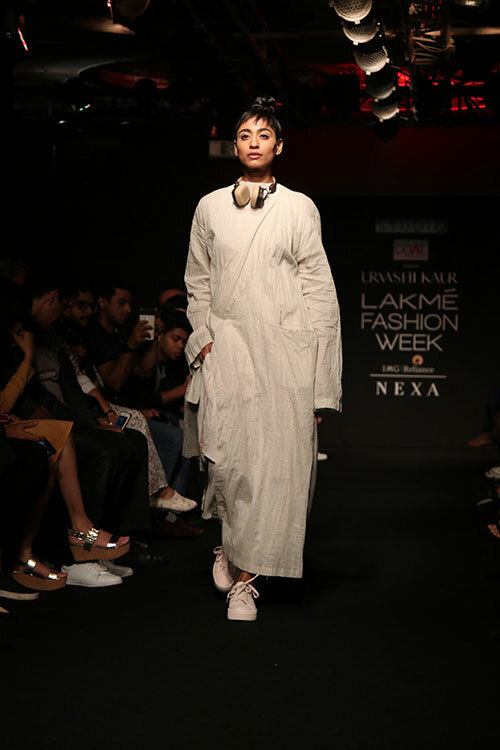 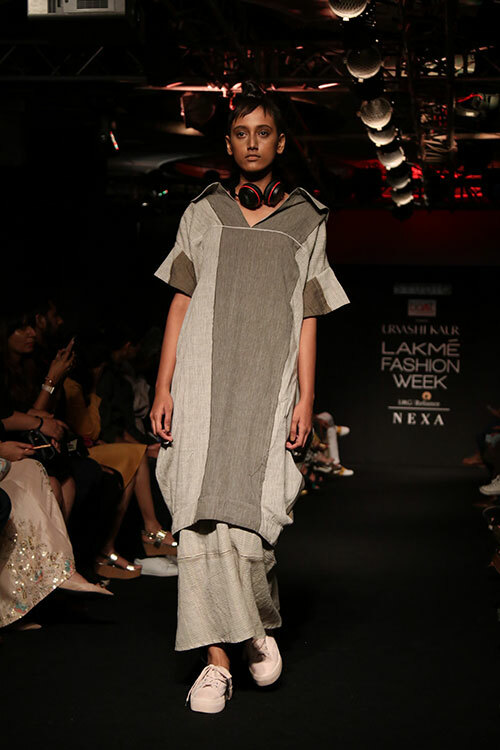 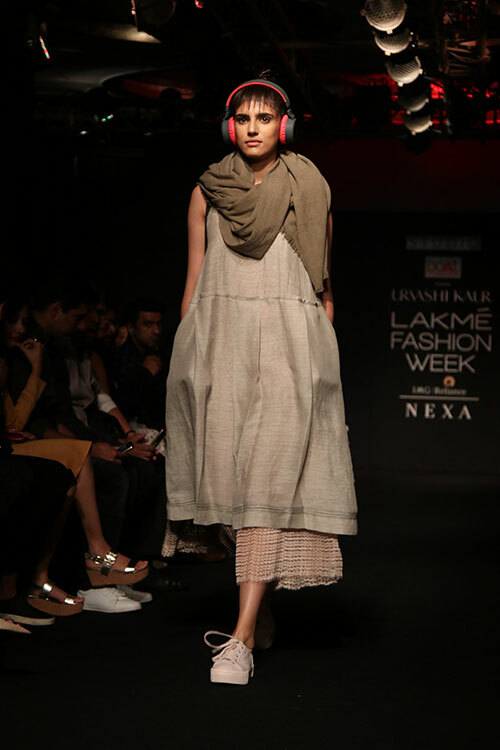 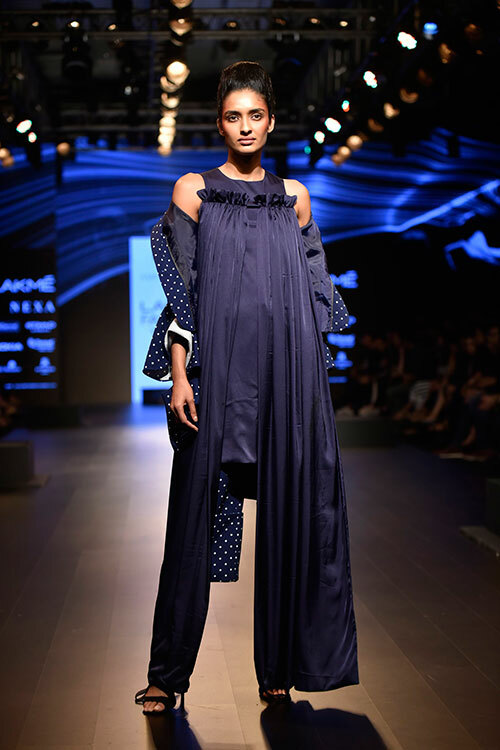 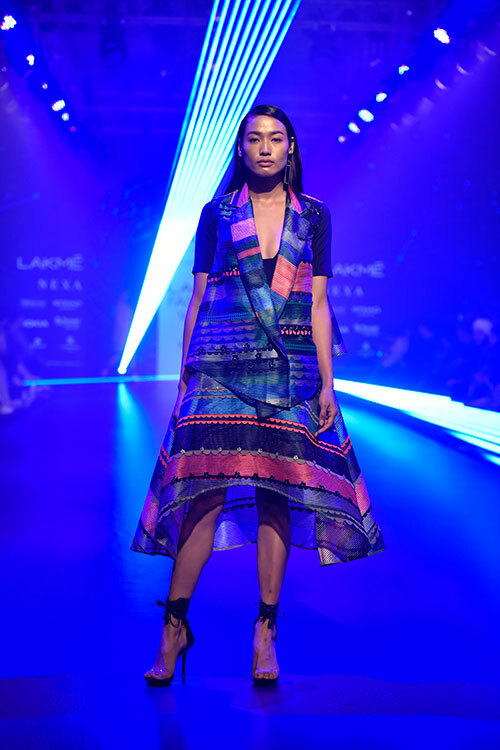 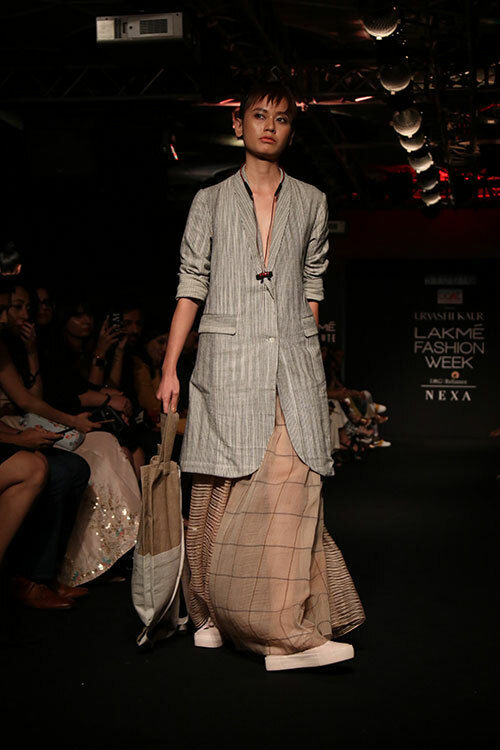 ‘Akara’ brough together all of Kaur’s strength as a designer; her love for natural textiles, colours and techniques. 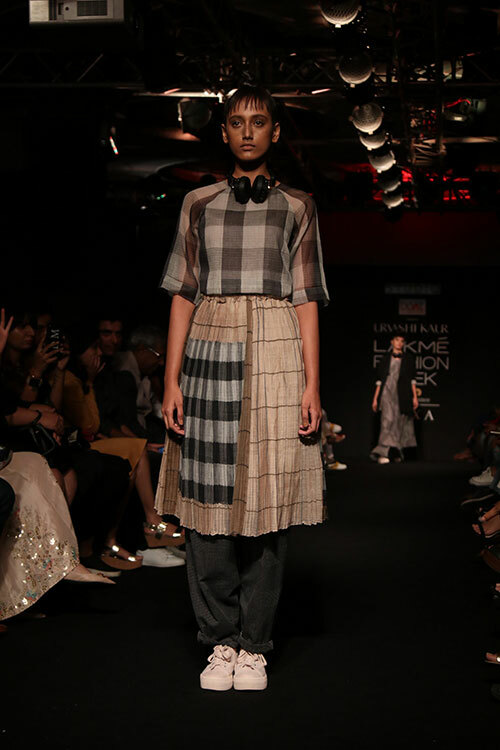 Discreet monochromes with grey, black and olive heading the list, paired with linear patterns that were perfectly translated into her signature hand block prints and some expert micro pleating on hand woven Khadi, sheer Kota Doriya and matka silk, the line-up was organic, simple yet eye-catching. 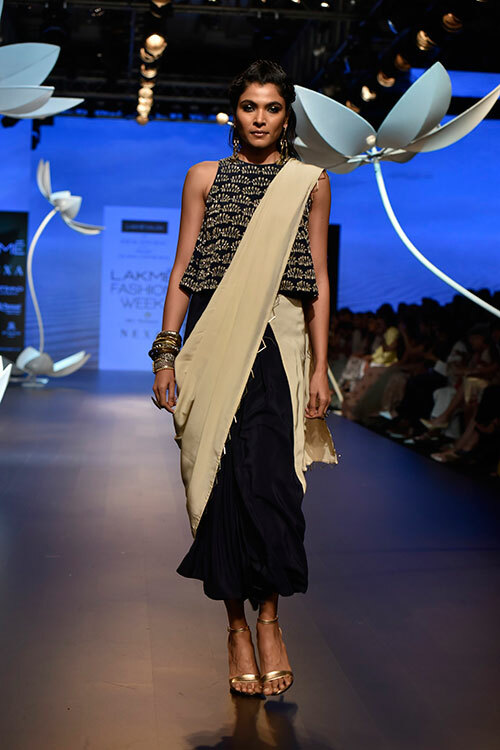 Adding further flavour to the fabrics story were crinkle cotton, sheer noil, silk linen and the amazing use of Shibori patterns. 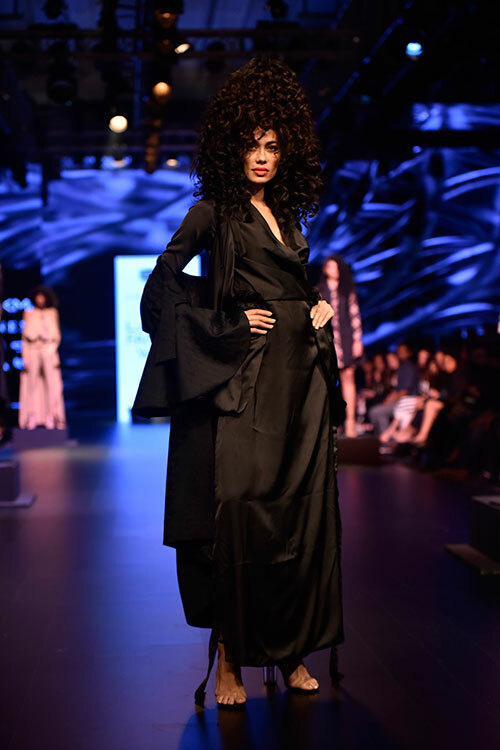 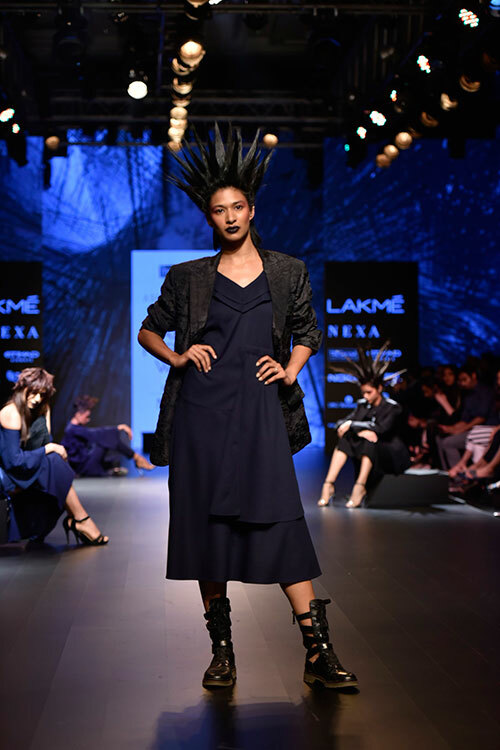 The idea of evolution played the pivotal role in Ashish N Soni’s collection, ‘Metamorphosis’, and the designer depicted that through his clothes and models’ hair. 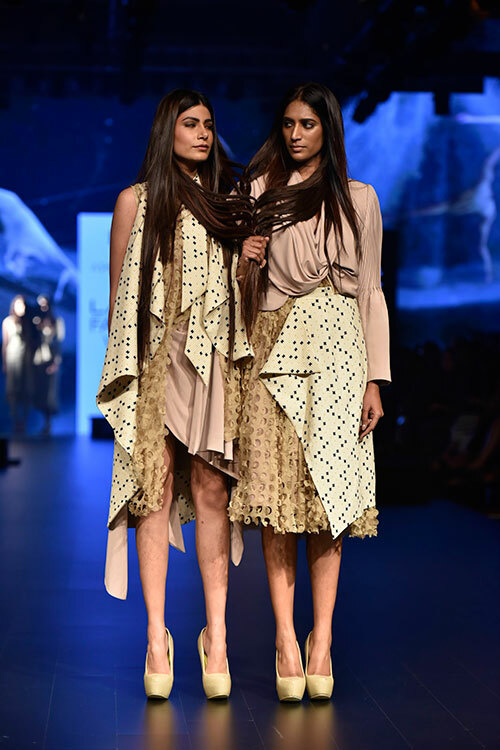 The former walked down the runway as though Siamese twins, with their locks wound together, only to magically separate through the gaps of their fingers, depicting how evolution takes place in nature. 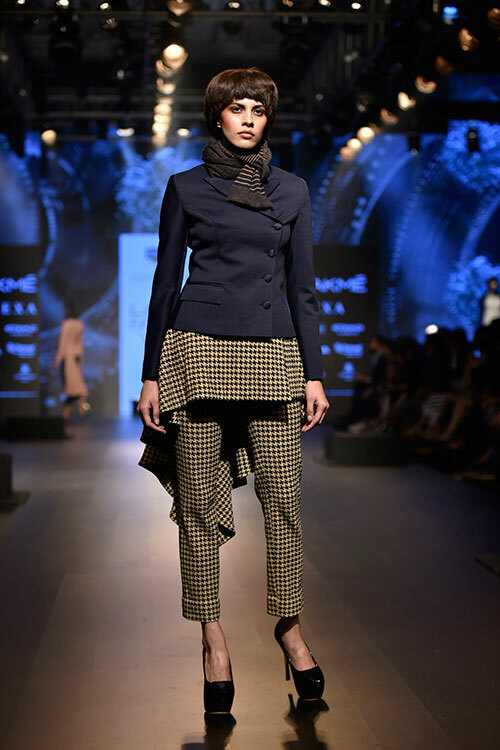 The inspirations a variety of shapes, styles and textures were merged to create singular garments, such as plain cloth with that of tartans and menswear and womenswear paired together. 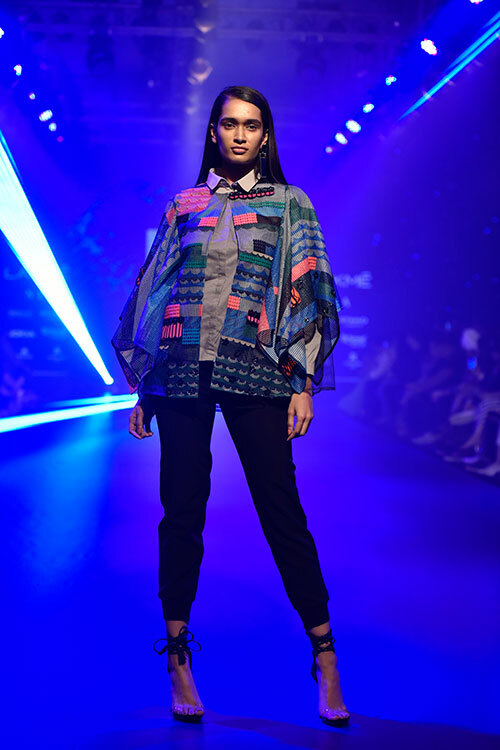 The collection also explored reconfiguration and the super imposition of patterns that not only created unusual 3D- shapes but also gave the lines a deeper and intellectual layer.